Your private tour begins with pickup from your hotel. Your professional guide will build excitement in your group as he/she describes the adventure you are embarking on. Our guides are passionate about and knowledgeable of the Florida Keys and you will love the fun facts you learn on your way to Key Largo. When we arrive in Key Largo, a tropical forest sets the mood for our destination and the incredible snorkeling found within its boundaries. The shallow waters of John Pennekamp State Park, also known as the National Marine Sanctuary, have an abundance of soft and hard corals and is loaded with tropical fish. There are more than a dozen different reefs to choose from and the reefs only average 6 -12 feet deep. 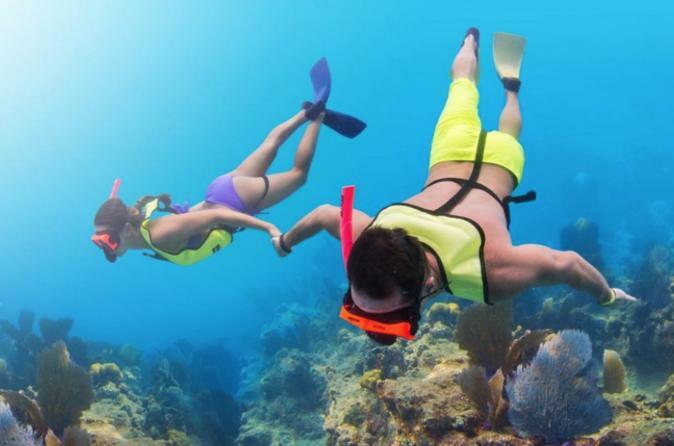 Everyone in your group will be able to enjoy the underwater beauty found in the Park. After the 2.5 hour snorkeling adventure in Pennekamp State Park, we take you to one of the most fun places to eat in the Florida Keys….Alabama Jacks. Alabama Jacks is the perfect embodiment of a Florida Keys Restaurant and bar, and their food is so good that the Food Network has featured it multiple times on its tv shows. Eating and drinking at Alabama Jacks is the perfect way to relax and wind down after a day in the water. You will love it!